So Pujo is over and even Lakshmi Pujo is over and I am late to wish everyone Shubho Bijoya but then technically I get time till Diwali to finish my Bijoya so it is fine. For a short update, the Pujo was good fun with me managing to land up at the Mandap all 4 days starting Saptami (Seventh day of Navratri) with the family in tow. I even managed to drape myself in nine yards of silk on 3 of those days and the pallu stayed without pins and the pleats did not give way, no mean feat if you know me. I also queued up for Anjali and offered Anjali at 8:30 PM every evening having feasted on breakfast, lunch, snack and everything else instead of the usual fasting that should have been propah, again no mean feat if you know my Ma. 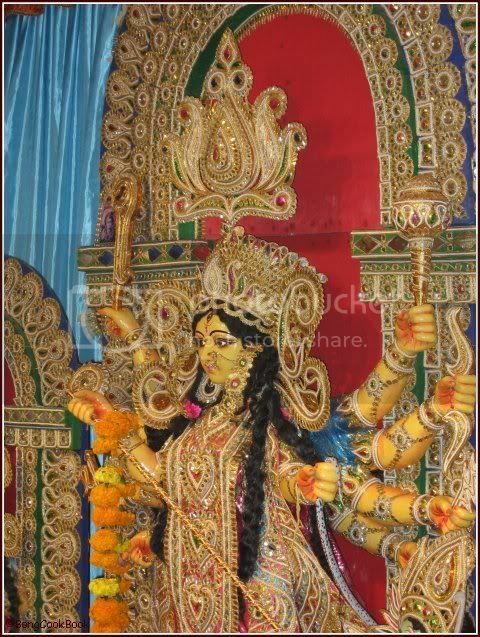 The daughter initially did not show much interest in Durga or the Durga Puja and claimed she did not much like Durga Thakur because Durga Thakur did not give her anything. I tried to get philosophical and told her it is Durga Thakur who had given her Mommy & Baba, but that did not impress her as she did not think these were creatures important enough to be actually gifted to anyone. Finally when I told her the Lego Bucket, which she incidentally had since last year, was actually brought by Durga, she got very excited and was also visibly pleased. The fact that she got a chocolate bar as Prashad from Durga Thakur clinched the deal and she became a major devotee and even offered Anjali with two flowers. 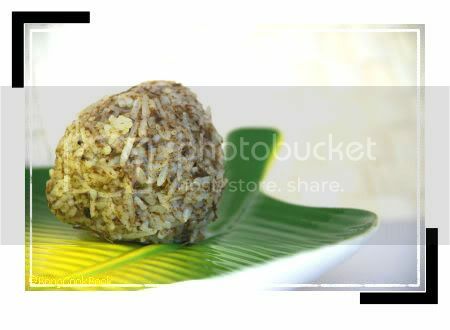 Dashami (tenth day of Navratri) was good too with Sindoor khela (married women applying Sindoor/vermillion to the Goddess and also each other) and there was some dancing at the Mandap , narkel naru (coconut laddu) and then nimki, followed by Biryani and kabab at night for dinner. I did not feel the immense sadness, guess I am getting used to real life deals. But while discussing Pujo, memories, food etc I forgot to tell you the most important thing, the one thing I liked most about Durga Pujo since I was a little girl of six. 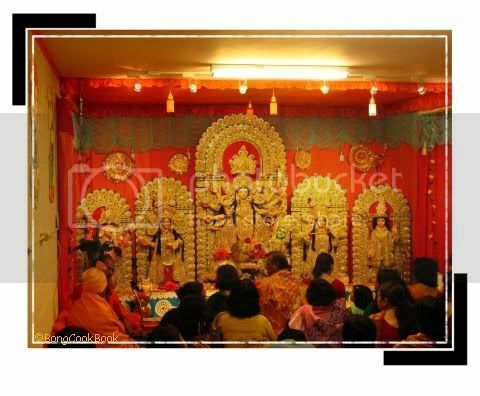 It is the Pujo Shankhya or the Annual Puja Numbers. Now Bengal being the literary state that it is, it has a very rich history of art & literature. So during Durga Pujo, the publishing houses like Ananada Publishers, Deb Sahitya Kutir etc. bring out special editions of the monthly magazines published by them. These special editions are thick volumes with literary gems from all renowned Bengali authors. Packed with writings by the best authors, these Puja Numbers are something I and every Bengali child in their right mind would look forward to. 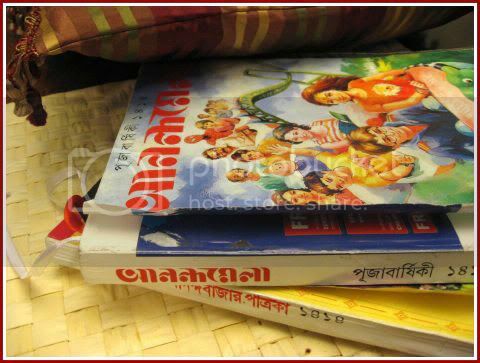 When I was a kid, my Ma in her effort to teach me Bangla would get me monthly subscriptions of the very popular Bengali children’s magazine Anandamela. During Durga Pujo this AnandaMela would come out in its special edition with colorful, glossy jacket and stories & articles in different flavors from all famous, almost famous, trying to get famous authors. It was the biggest treat a child could ever have. Those days these were published and available in the market around Mahalaya and in our small town we would book our copy with the local paper wallah days in advance, in fact right after summer. So while Mahalaya meant getting up at 4 AM to listen to Birendra Krishna Bhadra, it also meant pestering the Paper wallah every day to see if the coveted book had arrived. I cannot quiet explain the excitement, the waiting, the longing for the book to arrive. Days were spent thinking what “Gogol”* might do and where “Santu”** might land up with “kakababu”**. The book would finally arrive along with My Ma’s copy of Desh or Anandabazaar patrika and many blissful hours would be spent in its magical pages. Even now Durga Pujo for me is incomplete without Pujo Shankhya and I either buy them here or get my Ma to send them. With the Sharadiya being published way in advance these days, my ma easily finds someone to send me the copies and their arrival heralds the onset of Durga Pujo. Along with shiuli and kashful, the Sharadiya Pujo Shankhya means Durga Pujo to me. I do not think I will get around teaching my daughter to read Bengali or maybe I would, but if I didn't, I know she will miss out on the wait for these special editions which with their glossy jackets and mesmerizing tales carried the fragrance of Durga Pujo. 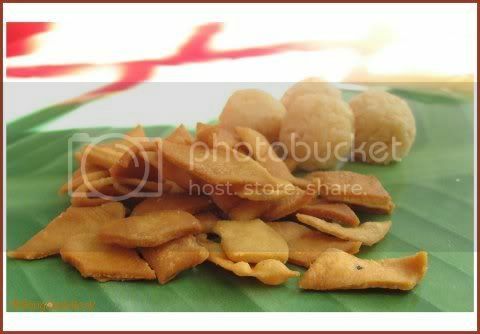 Do you have any Pujo Shankhya favorites or if you are from another Indian state do you have a similar concept of Special editions which are extremely popular ? Aaj Shosthi, the Sixth Day of Navratri and the first Day of Durga Pujo. As I pulled the car out of the driveway, I rolled down the windows and sniffed the air. It was crisp, clean and yet I could faintly smell the shiuli, the tiny white flowers with their deep yellow stalks which carpeted the back garden at my grandma’s house. This was the season they bloomed in abundance, pristine white, heady fragrance offering them for the Pujo. It was still dark and I listened intently. It was quiet except for the cars whooshing past, and I strained my ear to catch the faint sound of the drum, maybe the dhaaki would be playing a playful practice beat at this time of the day. As the day dawned, the sky was overcast but the forecast predicted a clear blue with cotton clouds hanging around, just like Sharat er Akaash (autumn sky) and my heart skipped a beat. For a fleeting moment I thought of the crowds at the Puja Pandal back home, the Priest announcing the Anjali* over the microphone, the jostling for the flowers for Anjali, waiting in queue for the prashad and Durga Thakur’s face smiling down benevolently at me. But strangely I didn’t feel a tug at my heart as I used to in my initial years away from home. Even in the absence of these, I could feel the rush in my heart because it was the first day of Durga Pujo. Maybe because more than anything Puja for me has meant being home with the family and this year I have family here, ok half the family. Durga Pujo always meant going back to my Baba’s home town in Bihar, to the address I had to write as “Permanent Address” in all my school forms. It meant days of waiting for the Puja Holidays to begin, of buying clothes and sarees for the family, of My Baba’s very happy face and my Ma’s not so happy one(she would be away from her folks). The essence of Pujo would begin with Birendra Krishna Bhadra’s voice on Mahalaya at 4 AM over the air waves. The excitement would mount until a day before Shoshthi when we would pile up two rickshaws with suitcases and head for the Station, to board the Tinsukhia** at an ungodly hour. The five days of Pujo would pass with two trips to the Thakur Bari every morning and evening. 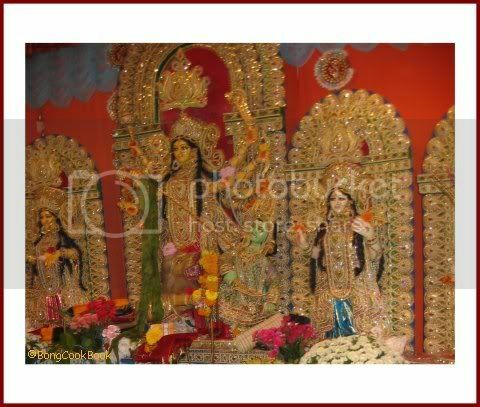 The tempo which was subdued at Shoshthi would gather a momentum by Ashtami the “Eighth Day of Navratri” and the most important Day of Durga Pujo. The Mandap would be charged with frenzied beats of the Dhak, Durga Thakur’s face would be glowing with Garjon Tel, her dark beautiful eyes would take a life of their own, the crowds would be at their peak and you felt a part of a huge celebration. Above the chanting of “Ya devi Sarvabhooteshu ”*** you could hear the announcer yelling “Guddu ki ma, aap jahan kahi hain, …” and you put in a prayer for the unknown little boy who was missing his mother. It was heady, invigorating and you did not have to a believer to be with the crowd. And then came Dashami and you felt a deluge of sadness. As my Ma and my Aunts bade farewell to Durga, by offering her sweets and sindoor, I felt a pain. There was this immense sadness of a dear one leaving for a far off land. 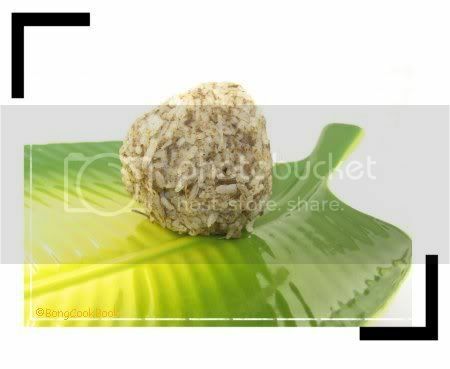 A sadness which could only be healed with the prospect of the sweets & savories earmarked for Bijoya Dashami. Thus ended Pujo, but the effect lingered as we went around visiting relatives for Bijoya and sampling Nimki, Narkel Naru and ghugni at the umpteenth house. By the time we were tired of the detoriating conditions of the Ghugni and the increasing hardness of the Narkel narus, it was Lakshmi Pujo and then time to go back home, to routine, to books, to exams. More than any mythology associated with Durga Pujo, I loved the folk lore which talks about Durga visiting her Mother’s home, the Earth, with her 4 children for a 5 day vacation every year. She felt like my Mother who too went back to her parents home once a year. I look forward to welcoming the daughter back to her Mother’s home every year in autumn and pamper her before bidding her a tearful farewell on dashami, when she goes back to her husband. Though Pujo here is not same as back home, I am still excited about going to Pujo tomorrow, to take out my silks and to see Ma Durga who is more like family who visits once a year than any Goddess. I shall offer my Anjali in the evening and reuse my flowers which I shall not throw at the Goddess' feet, see Sondhi Pujo on Friday evening and wait for the 108 lamps to be lit albeit by electricity, wait for the Arati and seek blessings from those flames for myself, my daughter, my family, have Bhog on Styrofoam plates balanced on my knees, catch up with friends and overhear elderly Bengali ladies displaying their expensive saree and jewellery subtly. Amidst the crowds and the haze of the incense, I will look up to Durga’s face and see her still smiling kindly and I shall hope that smile gives my daughter belief in her own strength and reassure her as it always did for me, that “all is well with the world and goodness still wins over evil” . That for me is Durga Pujo. dhaaki -- The drum players, who came from the many smaller villages to the city to play the dhak, the drum, for the Puja. Update: This goes to Jihva Special Edition: JFS Dassera at Past, Present & Me. Thanks Vee & Lakshmi for reminding. If you have special Durga Pujo Memories please leave a comment with your Durga Pujo Isspecial. Would love to hear from you and have a virtual Adda. Yes, this blog is ONE. 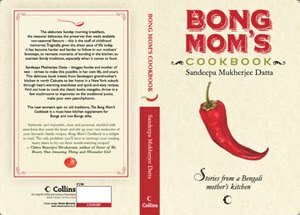 Bong Mom has now been officially around for a Year with her Cook Book and the 3 year old (not the blog, the daughter) now turning almost 4. It has been an eventful year if you consider all the events I have sent my posts to. The journey has been memorable and so Thank You. “My Mommy’s blog is One in spite of my “Know all” Dad’s predictions that it would die a sure death in 3 months time like my Mommmy’s numerous other hobbies. My Mommy Did it, she Did it, she Did it, yeehhhhhhh. And this is my art work for her. I love how she keeps typing and editing pictures on the computer and keeps telling me it is office work. I feel so happy that she is sometimes so busy with her blog, she even forgets to serve me dinner and my “Know all” Dad lets me have Chicken Nuggets, how fun is that. I added Mango Pulp to add Mango flavor to the Sandesh however the amount I added did not do anything except to introduce a faint flavor. I would suggest using Mango essence or Rose essence instead. Also layering the sandesh with fresh Mangoes or more of the Mango Pulp might have helped. Next time maybe. Mix Ricotta, C. Milk and Milk Powder in a bowl to a smooth consistency. I added Mango Pulp to it too. Instead you can add some essence like Rose, Mango etc. Next I Greased an oven proof bowl with about 1/4th tsp of ghee and poured the mixture in it. While pouring the mixture I topped the first layer with little mango pulp and then covered it with second layer of the Mix. If you have fresh ripe mangoes, cut it in thin layers and use for layering. Cover the bowl with an aluminum foil, cover else it will get dry. In the top tray put in the bowl with Mix and let it cook for 40-45 minutes. At the end of 40 minutes take it out to check if it has set. Run a knife to chcek. It might take a little more time, I usually switch off the oven and let it sit in the oven for 10 more minutes.. If yes, put it to cool in the fridge. 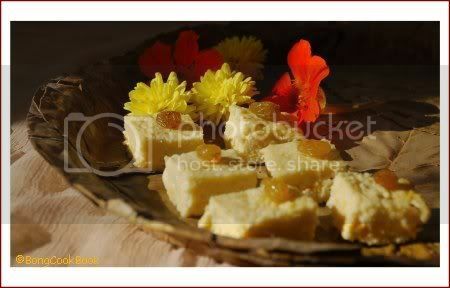 * The sandesh in the pic is served on a plate made of Sal leaves which my Baba sent from Kolkata for the blog. 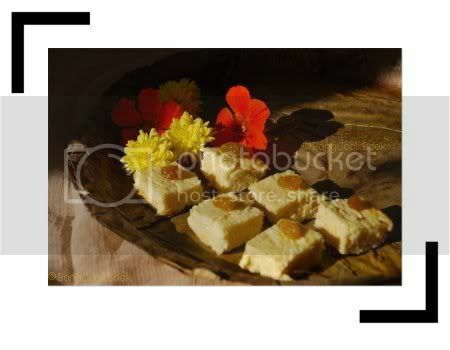 This is the the kind of plates that is used or was used in bengali wedding etc. along with earthen glasses. They have an aroma that reminds you of the trees in the forest after a fresh rain. The fact that they are bio-degradable helps. Kalonji in my glass spice bottles, jet black, like the hair I always wanted before the era of streaks and highlights. Kalonji in my hand, tiny, coarse to the touch, crowding and jostling, waiting to flavor my food. Kalonji in hot oil, tempering, dancing around merrily, haunting me with the aromatic flavor, I cannot put a word to. I see it described as acrid, smoky....but I am not sure. 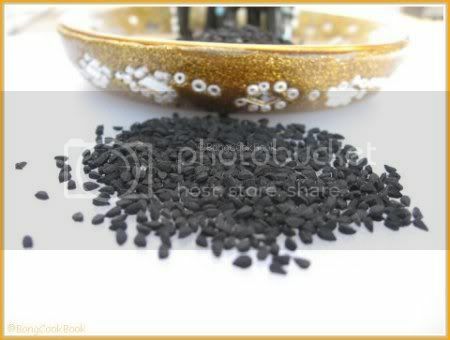 Nigella seeds are small, matte-black grains with a rough surface and an oily white interior. They are seeds of a plant Nigella Sativa, of the buttercup family and are often confused with Onion seeds. Nigella probably originated in western Asia but today is cultivated from Egypt to India. Cultivation of these black seeds has been traced back more than 3,000 years to the kingdom of the Assyrians and ancient Egyptians. A bottle of black cumin oil was found in the tomb of King Tutankhamun, perhaps to protect the ruler in the afterlife. 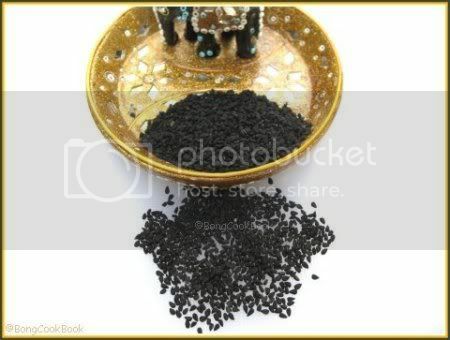 Known as Kalonji in Hindi and Kalo jeera in Bengali, Nigella is used in India and the Middle East as a spice and condiment and occasionally in Europe as both a pepper substitute and a spice. It is widely used in Indian cuisines for its smoky, pungent aroma. In Bengali cuisine it is almost as popular as Paanch Phoron and used for tempering, vegetable dishes, Dals, fish curries and some chutneys. It is one of the five ingredients of Paanch Phoron. It is also added to the dough while making Nimki a savoury fried dough. The flavor within the seed is enhances after it is baked, toasted or fried in a small amount of oil or juices of foods. In Islam, it is regarded as one of the greatest forms of healing medicine available. Muhammad once stated that the black seed can heal every disease – except death. Black cumin and its oil have also been used to purge parasites and worms, detoxify. 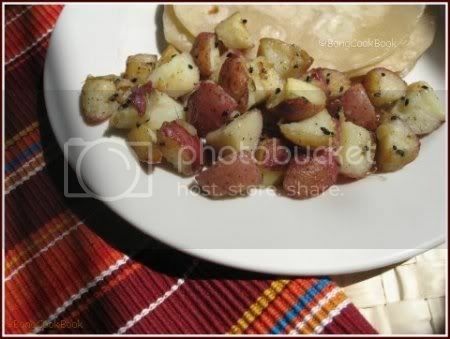 A very simple recipe with Nigella seeds is the Alu-Charchari, a quick stir fry of potatoes. Trivia: The many uses of nigella has earned for this ancient herb the Arabic approbation 'Habbatul barakah' meaning the seed of blessing. Here is my entry for JFI-Banana for Mandira -- Kanchakalar Khosha Bata or Paste of Plantain Peels. Can I say Plantain Peel Pâté, to make it sound French ? So yesterday when I was gloomily chopping up a kancha kola aka green plantain, for shukto and was on the verge of throwing out the plantain peels my Ma-in-law said…”Waiiiiiiiit” !!! Now she does not know about my blog or JFI, but being the Quintessential “Bangal” she knows what to do with vegetable peels all right. "Bangals" as I had explained earlier is the colloquial term for people from East Bengal now a separate country called Bangladesh. "Ghoti" is the local term for people from West Bengal. These terms are mostly used in jocular fashion and indicates the ancestral roots of a family as to whether it went back to East Bengal or West Bengal. There is a subtle difference between the two cuisines and while the “Bangals” know to put vegetable peels to good use the “Ghotis” know how to apply those to their faces, still better use. So me being the “Ghoti”, stared blankly at those greenish, and now turning black plantain peels and racked my brains to think what good could come of such…ahem disgusting looking stuff. When my Ma-in-law said that to make a paste out of it with Garlic, Kalonji and green chilies I thought maybe her knee pain had travelled further up North and maybe she has lost it… But then I complied without retorts just because I thought this was my last chance to send some plantains for JFI, even if only the peel. The smooth paste was made and then sautéed in mustard oil, till the raw smell left, the paste dried up and the “ugly duckling” turned to a beautiful tasting pate. It tasted real good but still did not look enticing when clicked. So the hubby came in and suggested to make a round with rice because the only way that this paste could be eaten and appreciated was with rice. Make a paste of Peel from one Green Plantain with half a tea spoon of Nigella Seeds/Kalonji, one fat clove of Garlic and 4-5 hot Indian Green Chillies. Add little water to make the smooth paste. Real smooth, ok ? Next heat mustard oil in a Kadhai/Frying Pan and sauté the paste at medium heat with little salt, till the raw smell leaves, the paste is dry yet moist and tastes great. I wanted to add some fresh grated coconut to it, to make it look better but my Ma-in-law said that is not how it is done. Maybe one of you cocnut lovers can try that.